The proofing process is important – both to you and to us. PDI will seek your approval, usually by hard-copy signature, faxed signature or detailed e-mail before we print a job. If you ask us to proceed on oral approval, or without reviewing a proof at all, any subsequent errors become your responsibility, and you will bear the cost of the printing project and/or the cost of reprinting the project in its entirety. In such situations, PDI will make every effort to correct the error expediently; however, rush charges may apply in order to meet the original deadline or an extended time frame shorter than originally agreed to – particularly if a custom paper stock or other necessary materials must be re-ordered from our vendors to complete the re-run. Often, an online proof – usually in a PDF format that you can run on your laserprinter and fax back to PDI upon approval – can be substituted for a hard-copy proof. This can cut several hours, or even DAYS off the production process, bypassing hard-copy proof production delays and the time needed to courier or ship proofs back and forth. An online proof, with few exceptions, also is less expensive than a hard-copy proof. CAUTION:Please note, however, that there can be significant variances between online proofs and final production pieces – the most common being color accuracy. 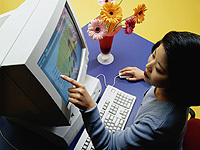 Proofs viewed on a computer screen or output on most personal and office printers, are seen as “RGB” color. PDI prints with “CMYK” color, using combinations of Cyan, Magenta, Yellow and Black ink. In addition to color shifts, most CMYK jobs appear less vivid, or “muddier,” than RGB documents viewed on a computer monitor. In addition, some evaluations of registration and perfecting, text clarity and image quality, are much less accurate with an online proof. An online proof laserprinted to fax-quality office paper may bear little resemblance to the PDI-output product. If these are not significant issues, if you have extensive experience in evaluating online proofs, or if you are providing satisfactory exemplars (e.g., color swatches, samples or previously printed materials), you may find that online proofs are convenient and adequate substitutes for a hard proof. For more information, ask your PDI sales representative for further clarification of our proofing procedures and policies. We’re happy to work with you to find a proofing method that best fits your needs.